The National Conference, its arch rival Peoples Democratic Party (PDP) and new entrant People's Conference led by Sajad Gani Lone have been talking about protection of Articles 35A and 370 of the Constitution in their rallies in the run-up to the polling which is scheduled to begin on April 11, latching on to BJP chief Amit Shah's remarks that Article 35A will be repealed by 2020. "Protecting the special status of Jammu and Kashmir as guaranteed in the Constitution of the country, is one of the main cornerstones of our campaign for these elections," National Conference vice president Omar Abdullah told PTI. "It is not a numerical argument, it is an argument based on facts. Yes we only have six seats but Jammu and Kashmir bats far above its rankings otherwise. The smallest thing in Jammu and Kashmir becomes international news, very big things in other states are often ignored. So, I think six members in Parliament can do more than 60 from another state," he said. PDP president Mehbooba Mufti is using the special status of the state and the buzz surrounding it to stage a comeback after her party's coalition government with the BJP fell last year. She has adopted a more hardline posture than any of the regional parties on the issues related to Article 35A and Article 370. "The relationship between our state and the country is based on our special constitutional position that legitimises it. If we remove, what legalises this relationship, it will turn into an occupation and colonisation," she said. Mehbooba, while reacting to Shah's remarks on Article 35A, said the relation of Jammu and Kashmir with India will end if the terms and conditions of state's accession to the Union were changed. "2020 will also be a deadline from Jammu and Kashmir to the nation. If you remove those terms and conditions on which Jammu and Kashmir acceded to India, our relation with the country will also finish," the former chief minister, who is contesting from Anantnag Lok Sabha seat, said. Lone, who was a minister in the PDP-led coalition government in the state from the BJP quota, has also vowed to defend the state's special status. 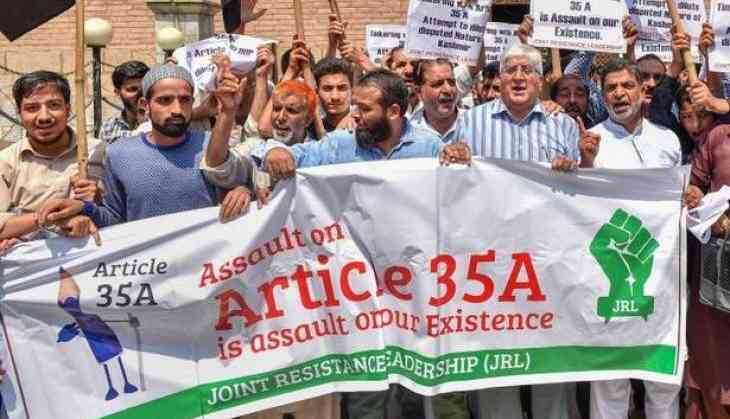 "Article 35A is a matter of faith and dignity for the people of the J&K through which the Constitution of India guarantees to safeguard the special identity and unique status of Jammu & Kashmir. In matters of pride and identity, profit and loss is immaterial. Can a country allow a foreign country to undermine its sovereignty and national pride just for the sake of some monetary gains," Lone asked. He said Jammu and Kashmir was not the only state with special residency laws. "All northeastern states and even Himachal Pradesh have laws prohibiting non-locals from purchasing land. Why are politicians in New Delhi only against J&K's special status? What are their views on Art 371-A to 371-K which guarantee provisions like 370 as applicable to the northeastern states," he said. "No power in the world can revoke Article 370 and Article 35-A," state Congress chief Ghulam Ahmad Mir, who is contesting from the Anantnag Lok Sabha seat, claimed.